Geary Street and Salem Avenue shortly after 3 p.m. on Jan. 30. The intersection was tied for the most collisions last year. Most of those caused only property damage, if that. As for injury crashes, the Albany ratio has been below 2 per 1,000 residents for the last two years. Thankfully, the ratio of fatal crashes was lower still, less than 0.1 per 1,000 residents. There were two fatal collisions in 2018. Geary Street and 14th Avenue, and Geary and Salem Avenue, were tied for the lead with 12 collisions each. The next three intersection all saw 11 crashes each during the year. They were Geary and Pacific Boulevard, Santiam Boulevard and Waverly Drive, and Santiam and Clay Street. 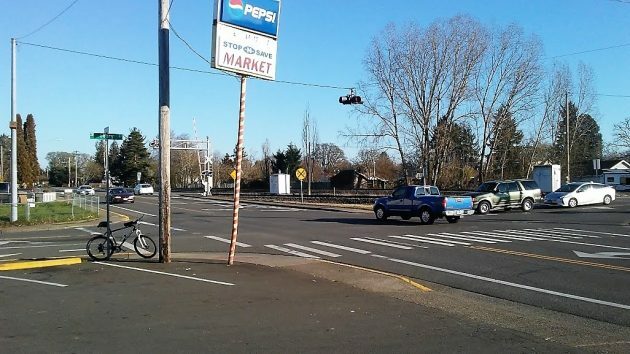 Of the five leaders in the Albany collision derby, the corner of Geary and Salem stands out because it’s the only one without traffic signals. Why? Presumably because it doesn’t justify signals because of traffic volume and other reasons. One complicating factor is that it’s very near two railroad crossings over multiple tracks. It is the same with firearms. There must be the human factor involvement to make a death/injury. The autos will remain dormant until a HUMAN takes control & thru lackness, inattention, carelessness, & a “I don’t give a damn” attitude a collision (aka death) happens. Lemme tell you about the “Bermuda Triangle” of the old intersection of Pacific Blvd, and Santiam in the early years. Daily, yes daily fender benders happened there. Did we kill as many horses way back then as we do autos now!!? ?